VENTURA — Sam Sadove, who until recently lived in the Hamptons on New York’s Long Island, arrived in Ventura after looking for a boat business in a better climate. “After this last winter, my wife, Karen, and I looked at each other and said, ‘we can’t do this anymore,’” Sadove recalled. The lifelong boater, diver and lover of the ocean is also a cancer survivor. He retired from his work as an ocean biologist during his battle to get well. 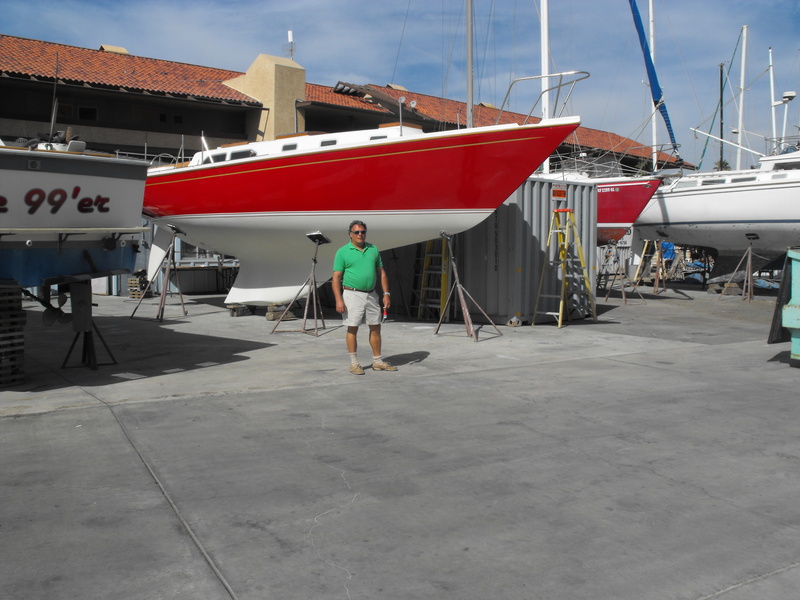 When he recovered, he quickly became bored with retirement — and he ended up working in the marina business, later becoming a partner in the operation. When Sam and Karen Sadove decided it was time to make a move, he had identified eight marina-related businesses — most in Florida and the Carolinas. Then, Sadove found out that the Anchors Way boatyard and the Scotch and Sirloin Restaurant lease was being offered for sale. One of Sadove’s longtime friends and former co-workers lives in Carpinteria, so he decided to come take a look at the business and visit his friend, too. “When Karen and I drove up the coast this February from LAX, we fell in love with the area,” Sadove said. “And, after reviewing the business, the harbor and Ventura, we liked what we saw. It’s definitely a diamond in the rough — neglected and needing a lot of care. But we thought it was perfect for us. Sadove went on to purchase the lease from the Ventura Port District, owner/operator of Ventura Harbor. The 15-acre parcel includes a 60-slip marina, a chandlery, a yacht services yard with a 25-ton lift, a dry storage yard with 150 yachts stored, the defunct Scotch and Sirloin Restaurant and buildings housing tenants including Ventura Sportfishing, Vessel Assist Ventura and a property management company. Sadove’s son, Alex, who has grown up boating and worked as a diesel mechanic and at marinas in the Hamptons, is now the manager of the marina and boatyard. “Karen and her daughter, Christina, will be running the restaurant,” Sadove explained. “It’s all in the family, this business. They both have extensive restaurant and bar management experience. “We are going to offer a moderately priced seafood menu, and we will have live music, as well,” Sadove said. Main Street Architects of Ventura has been hired to handle the remodel. Sadove said he plans to have the restaurant reopened by April 2012 — and the redesign and construction is projected to cost between $350,000 and $500,000. Coming from the nonprofit sector before his marina management days, Sadove founded Okeanos Ocean Research Foundation on Long Island, providing whale-watching tours and other educational offerings. Sadove, who was an environmental biologist who worked with sea mammals and sea turtles for more than 30 years, said operating a “clean and green” business is important to him. He and Alex have already made great strides in cleaning up the marine services area and boast total recapture of materials in the yacht yard. “We’re updating drains to collect and filter debris from water,” Sadove said. “We use dustless sanders and clean the yard up daily. “We also plan to increase the slip count and completely renovate the marina and dry storage yard,” Sadove said. In addition, the Travelift will be upgraded to offer 50-ton haulout capacity. Before purchasing the lease, Sadove looked into the possibility of increasing the number of marina slips from the current 60 to 300. The Ventura Port District already has a master plan to accommodate the increase. This will allow for more transient slips and liveaboards, as well as guest slips for the restaurant, Sadove said. Sadove has already begun participating in local community events. He was a sponsor for Ventura Caregivers’ annual Sailathon fundraising event Oct. 9, and he provided free use of his restaurant facility for a Los Angeles at-risk youth group that needed space for educational sessions.